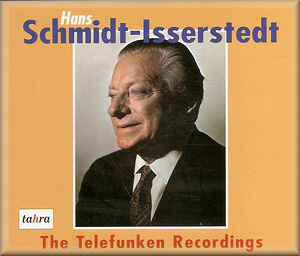 Schmidt-Isserstedt was busy in the studios and recorded for a number of labels — Decca, Telefunken, Capitol, Mercury, Philips. DG, Odyssey and Electrola amongst them. In the 1950s he made a valuable series of discs for Capitol and another series for Telefunken. Tahra has released both in sets of three CDs each. It still seems rather anomalous for Telefunken to have released the live recording of Haydn’s Symphony No.92 given that the conductor was heard on an Australian tour conducting the local orchestra in Sydney. Still, that rare LP, LB6056, housed the performance and it was a good one. The orchestra was on solid form, responsive and alert. The first movement repeat is jettisoned but otherwise this is a well balanced, unsensational reading with an especially well-moulded slow movement. I think it’s best to overlook the amazingly over-enthusiastic booklet note claim on the subject of this recording of Dvorák’s New World Symphony. The balance isn’t especially favourable and the percussion booms mightily, whilst there’s a rather brusque quality to the sound — not unlike certain aspects of the performance, it must be said. The big-boned slow movement drags in Germanic fashion at the conductor’s misconceived tempo. His favourite Dvorák symphony, needless to say, was the very much more Brahmsian Seventh. The second disc carries a straightforward reading of Tchaikovsky’s Pathétique Symphony, symphonically speaking much more of a success than the New World. It’s hardly in the Mravinsky class as an act of dramatic engagement, and the second movement is a bit lackadaisical, but there is a real sense of power held in reserve throughout. There are two fillers to end this disc — a roistering Liszt Hungarian Dance and Rimsky’s Flight of the Bumblebee, which brings out the clean-limbed and athletic side of the NWDR strings, as almost always on fine form. The last disc is given over wholly to Schubert’s Great Symphony. As the companion Fifth showed in the Capitol box, Schmidt-Isserstedt was an excellent exponent of this composer’s music. He knew how to bring lightness and agility to the symphonic canon, too, and here in this stereo recording — as were the Liszt and Rimsky, but nothing else — he proves his credentials again. The orchestra plays excellently for him, and he paces episodes and paragraphs astutely, bringing a considered and intelligent view to bear. Of all the performances in this box, this is the one to which I’d direct listeners keen to hear the conductor at his best. The transfers have been well engineered and the booklet is attractively put together with full colour reproductions of the LP covers. Sami Habra’s notes are partisan to a fault, but his admiration for Schmidt-Isserstedt shines through everything he writes and one can both admire, and repudiate, the passion with which he holds his views, if one so chooses.